That was the thing which I liked the most, one more reason to go outside, more on its benefits later on. It was like some kind of force pushing me and whispering me: meet your city, see it, love it. Well… I did it. For 7 months active playing few hours a day, I manage to make 1800 km, some days I was reaching 25km a day, seeing places and things which were always there, but I didn’t notice them. I learned a lot of history for people and places in the process, even dared to take adventures which I otherwise won’t do. 2. It makes energy. It seems like a paradox, but a brisk walk is one of the best natural energizers around. It boosts circulation and increases oxygen supply to each and every cell in your body, helping you to feel more alert and alive. 4. A good walk can help you strengthen and shape your legs, giving great definition to calves, quads, hamstrings and lifting your glutes and if you really pay attention to your posture as you walk, it can tone your abs and whittle your waist, too. 5. It’s good for your brain. The adventures are many, the friends even more. Visiting cities all over Bulgaria was the beginning, we did go even further. With friends we traveled to Macedonia, Serbia & Greece, met new people, learned a bit of history from here and there and had great time with awesome people. Now, after I told you this long-long story, however, because lately often happens to explain Ingress, I decided to use my most favourite application Grafio, and surprisingly enough I am one of the developers, to make the Infographic below to let me tell this story more easily, so long story even shorter – see the words in their visual beauty. 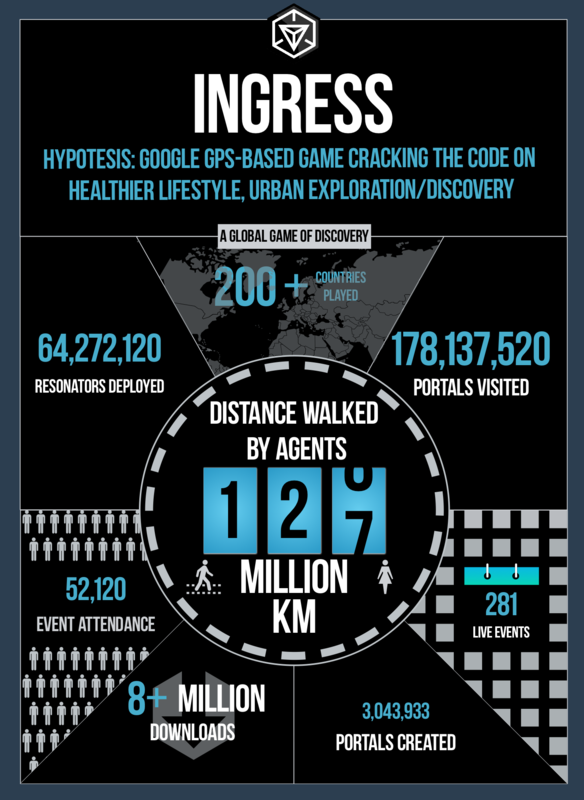 The infographic itself isn’t something new, it’s insipered from similar one published in 2012 for 2 years of Ingress release.